Another project completed this year was the restoration of our old cabin. My grandfather purchase this 80 acres farm from the Lowe family back in the 1940's. The first picture is the original cabin around 1946. The cabin was done with hemlock board and batten and creosoted. I painted it brown still desiring to restore it. Well, last year I found a place that would take the old siding and had all of the hemlock locally sawn by a Lowe, pretty ironic, although he is not related to the Lowes my grandfather bought the place from as far as I can tell. I used a pecan stain on the wood, since creosote is out of the question in today's cancer and environmentally sensitive world. And as you can see it looks much better than the original. I am sure grandpa and grandma are smiling somewhere watching all the work being done to the old place. 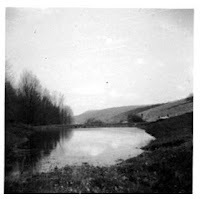 The first two pictures were taken in 1956 when my grandfather first built the pond in the back of the property. It was constructed by damming the valley between the two hills. It is interesting to notice the lack of trees on the side of the hill behind the car. My grandfather's luck with the pond was not good. I don't remember the first time it broke, but I do remember the second... the hurricane, Agnes, which hit soon after he reconstructed the dam. 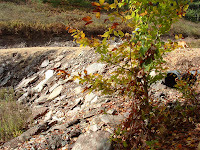 The dam didn't have time to settle and washed away easily. 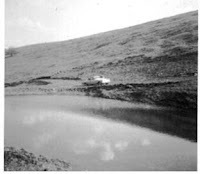 That was the last time any amount of water was in the pond and the last time my grandfather tried to fix it. Fast forward two generations to me. Something always eats at you when you see something your grandfather wanted so bad to work fail. I have had the desire to restore the pond for a long time. I have been nay sayed by those who would like to give it the same fate as my grandfather's attempts, but silly me I thought it could still be done. offset them to one side and allowed and emergency overflow towards the tree side of the pond. With that all said until the dam settles and the seed I planted gets a good root it is in the danger phase. I will breathe much easier if I make it through the end of May with everything intact an growing. Since this year is the driest we have had for a long time, I am hoping it is a good time to try. So far the little rain we have gotten has barely moistened the pond, my grass is sprouting and we are off to a good start. I will update you on any changes and show you pictures of any water I get. If everything holds stocking it with fish won't be far behind. On October 6th, my best friend Jack, who you also see in my profile died in a tragic accident. He was in the prime of his life at 7 and had a full life up here on the mountain chasing and fighting with the bears. Tangling with skunks and worst of all porcupines. Friends have told me before he died you need to write a book about Jack's adventures. Perhaps someday I will right now the pain is too fresh from seeing him go. I adopted him from a shelter in 2002 and he came to the mountains a city dog and a pitbull without fear. He ran after everything at first and went right through the multiflora rose after many a rabbit. He did learn that wasn't the best way to catch them and resulted in many thorns to be removed and tears to his skin. Jack was an agile dog and could walk on the narrowest ledge and make it look easy. He jumped into my truck without as much effort as most of us would take to tie our shoes. After following me back to our pond in the truck something happened...I heard a yip and looked behind me to see him holding up his paw. I stopped and the person riding with me got out... as he did... Jack ran up and jumped into the truck...I walked around to look at his paw...as I lifted it he slumped into his favorite truck and died. For someone who is deeply connected to nature and her animals it has been a hard time for me. I buried him a top the mountain and he is watching over us with the best view around. The leaves peaked today and from the top of our hill it was a milliondollar view. I have been very bad with posting this summer due to all my work and it seemed every time I took pictures by the time I went to post them they were out dated. There were a ton of people up in the woods this weekend and they were only outnumbered by the ladybugs "chinese beetles". They have been insane this year when the sun comes out it is best to hide. Even though we spray the outside of our house. They ride inside on us and the dogs. They die in large numbers along side the house and we are constantly sweeping them off the porch or listen to them crunch as we walk on them. These smelly bugs are not my favorites but with colder weather coming their reign will be short.